What are the different radial heat map settings? With Mapline’s radial heat mapping, you’ll find many settings you can configure to view a customized radius circle on a map. This page will explain each of these settings to you. 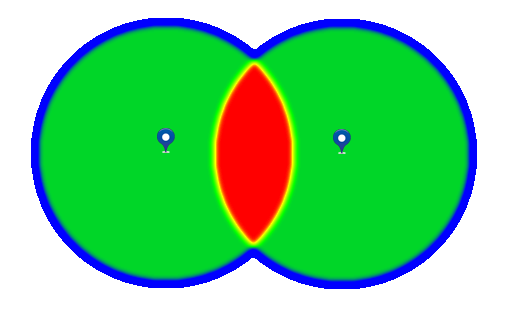 When you create a radius map, you can “apply the heat” in two different ways: Areas Around Pins or Overlapping Radius Areas. This is set in the “APPLY HEAT TO” drop down option. Below the “Apply Heat To” setting, you’ll find an additional “HEATMAP BASED ON” option. When you set this option to “LOCATION DENSITY,” then you can quickly identify the clusters for your pins (as mentioned above). Or you can change this setting to “DATASET VALUES,” to see high value pins. For example, if you have pins representing customers and each pin has the customer’s annual sales, then you could select the “Annual Sales” column, and the heat areas would show the customers with high annual sales. The heat spots show the values within a distance of the color pixel. So, unlike the Density Type heatmap, any color on the Coverage Type heatmap only has a single meaning: the value for a spot on a map. Therefore, a legend can be shown that has numeric values. When you set the “HEATMAP BASED ON” option to “LOCATION DENSITY,” then you can quickly identify the areas on a map which are within your specified distance (“SIZE”) of your pins. If you have a map with customer pins, and you set the size to 5 miles, then areas with the highest number of customers within 5 miles will be red, and areas with only one customer within 5 miles will be blue. If you set the “HEATMAP BASED ON” option to “DATASET VALUES,” then this will show you the areas on a map which are have the highest total (or average) value within the specified distance (“SIZE”). For example, if your “SIZE” is set to 5 miles, and you select “SUM” and “SALES,” under the “DATASET VALUES,” then the red areas with the highest total sales within 5 miles would be red, and the areas with the lowest total sales within 5 miles would be blue. The “ADVANCED OPTIONS” enable you to customize your radial heat mapping even more. These options include the ability to set the “OPACITY” of your heatmap as well as define whether you would like the outer edges of the heatmap to “FADE” to transparent or not. You can also set the “BLUR” option to blue the colors together more, and finally you can determine whether you would like the “LEGEND” to appear. Which Radial Heatmapping Type Should I Use? Pockets with high densities of customers. Large customer accounts or areas where many customers are located. Overall high risk areas for disaster recovery planning. Location to hold a seminar. Optimal place for an office location or distribution center. Report performance by geographic areas of customers or sales.